I couldn't resist putting my two cents in as it relates to Karl Lagerfeld using a plus size model for a Chanel ad. As I have learned in life, the hard way I might add, is I refrain from being so quick to say what I won't do. As it applies to fashion, love, hate, politics, etc. I have found myself many times doing the opposite of what I said I would never ever do, for example, I thought I would never put myself in a pair of hammer pants, but as you saw one of my previous blogs I did subject myself to the trend. I saw that it didn't work, but my curiousity did get the betterment of me. With that being said, I think if nothing else, the Chanel ad says that demand is on the high rise for plus size fashion. 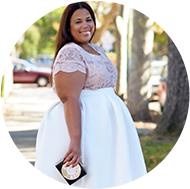 We could very well be on the turning point of fashion where mainstream fashion starts to offer what it has only exclusively been offered to sizes 0-8. Speak with your dollars and the rest will come. The optimal situation is that we could take the use of plus size models and plus size fashion in mainstream and turn from a fad into a staple. As plus size women we have to put our money where our mouth is if we want to see more designers make plus size clothing. I follow retail sales and almost everytime it shows a lack of sales in the plus size arenas. A few months ago ANN Taylor and Loft stopped carrying their size 16's & 18's in store because sales were low. Many designers are afraid to make plus size clothing because they think it is not going to sale. Even sales of Michael Kors plus size designs are low. So, if we want to see clothes in sizes beyond the accepted 12 & 14's we need to start buying more. @Savonne - Bravo! I couldnt have said it better myself. If the only thing we buy is Rainbow clothes that all we will get. This shoot was an editorial in V magazine and not an ad for Chanel. I think that it is important to note that Dirty Martini is only wearing accessories in the spread. and not any clothing.